Who will win: SW Composer vs “WordCAD”? If you’re active in the industry, then chances are that you’ve heard of SOLIDWORKS Composer. This is a tool for generating graphical content for all kinds of manuals and marketing materials. Logically, it should be first choice for the SolidWorks user according to the marketing message. Social media is filled with nice examples and success stories on how the use of this software will benefit you. Generally technical writing is just a formal need in most companies. The youngest engineers or even the trainees get tasked with writing instructions, manuals and with making “a couple of renderings” for marketing department. All experienced engineers will avoid this job so much as possible because it’s very time consuming and usually takes a lot more effort than may seem at first glance. There’s also the misconception that it’s merely a task too childish for experienced engineers. But for a minute, let’s imagine ourselves to be that young engineer who gets assigned with making an assembly instruction for product X. Now this product X has already been in production for a few weeks and its second revision has been released. Due to an increased demand for it, the production department needs to hire more workers, but to teach new people one needs good documentation and as always – the deadline is yesterday. Let’s assume that the design of the product is done in SolidWorks. However, there are some important gaskets and sealants that are not modelled. Additionally, a bearing must be heated up to be inserted into the shaft and some slot head bolts need to be filled with grease. It’s situations like this that show why using simply a model based approach can be difficult. Assuming that everything can be described in a 3D model is just too much. Making those models for the aforementioned items would take a huge amount of time and let’s not forget that time is money. The second issue is how to describe the additional tools that are part of the production process? Should we model them and add them into the model? As I am sure that this concept could work perfectly, I’m just don’t see it happening outside of the PowerPoint presenations of sales representatives. Even well prepared demos won’t cover all the complexities of real life. There are basically two feasible approaches. First of all, the person tasked with the job will have to go to the workshop and come out with materials that will make it clear to everyone what the best way to assemble is. He will also take a phone and use it to take a lot of photos in the process and a smart engineer will also use the time there to get help from the workers, who can share tips and their input on how to make the manufacturing process as streamlined as possible. Now the next part will take place in the office. 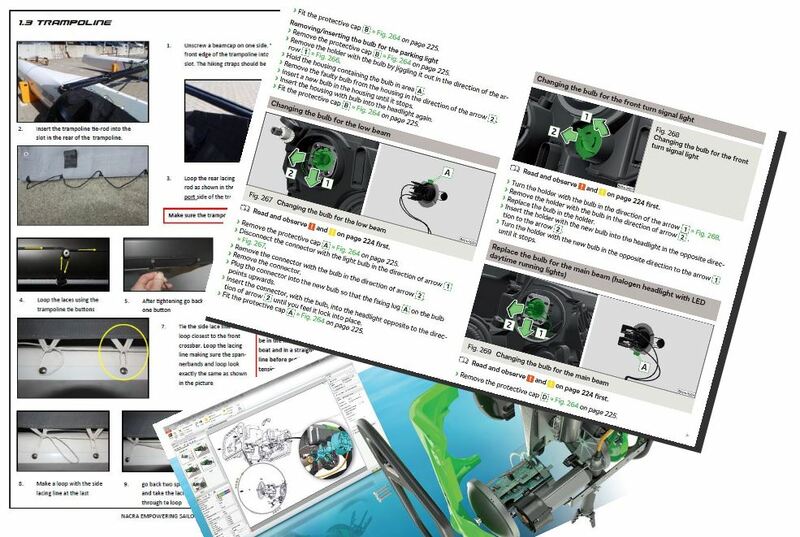 This brings a classical dilemma whether a manual is good enough, if it’s just a Word document with important notes and arrows or should one replicate the photos taken in a CAD system, use SW Composer and make a really nice graphical representation that can be used in that same document. If you were to draw a graph that had “time” and “money” on it, it would become clear pretty quickly that the engineering manager will care more about the money and the deadline, than about how good the manual looks like as long as it gets the job done. Before everyone had cameras in their pockets and color printers in an office were more a dream than standard equipment, the creation of such manuals was extremely hard and time consuming, but this needn’t be the case these days. To make it clearer, let’s use the classical way of writing a rating matrix, with scores ranging from one to five. One indicating the lowest score and five the highest. Price 1 5 Text editor and camera is de facto available for every computer/person. Learning curve till performing 2 4 Composer need more experience. However, taking photos is and redraw may be need some guidance. Time comsumption 2 5 After photos are done there is need to redraw them into Composer. Updating manual 4 2 When there are small updates then composer is really cool. Needs "perfect" model 2 4 For example adding stickers for example for model is time consuming but whe nstickers are added to real. Manual can be started before parts are available 5 3 Don’t forget that SOLIDWORKS can be also used for screenshots. Pictures looks nice 3 2 Everything depends form person. There is not possible to assume that photos looks bad. According to this table “WordCAD” comes out on top. The reason for this is not technical, but mostly just the general situation. In a scenario, where the company already has a Composer licence and an experienced user to work with it, the difference would not be so great, but there are tons of relatively small companies, who do not have the dedicated people or the software. In such cases this may be the smarter approach to take. There can be situations where Composer is irreplaceable due to high risks and everything having to go just right on the first try. Such cases however cannot be treated as ordinary business and chances are that in such cases the creation tool used is not a priority. Looking at the average company with classical problems and topics, the simple “Photo-Paint-Word” approach may be far more reasonable than using specialized software. Coming back to our young engineer: doing it quick and simple, he will probably have the manual done with basic tools long before he will convince the manager to get investments for new software and training approved. In the past I have changed my mind about a lot of things as I’ve learned and grown in the industry and I’m sure over time this will happen again so feel free to chip in with all your ideas, thoughts and experiences in the comment section below!